One of our bunches of flowers! Dancing around the Maypole. Notice the dog, he was not happy with us doing this. He barked the whole time. 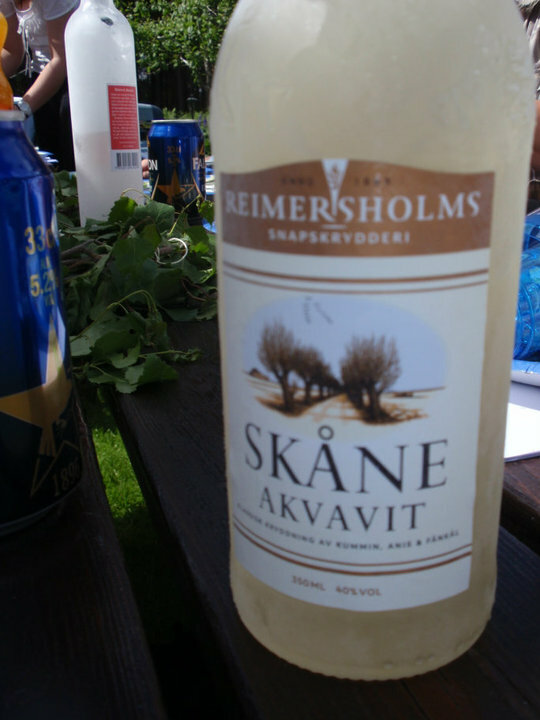 Akvavit! Helan går! Famous Swedish drinking song, translated "the whole goes down!" One of the drinking songs. Lasted about 5 minutes and throughout the song you put the hat one, then the ears, then the teeth. It's so funny and hard to sing with those teeth in! Cousin Caroline. Could she be any more beautiful and Swedish looking!? :) I love her to death! She's such a great person to be related to! My husband, who just happens to be the most handsome man on the earth! Even when he's wearing a crown of wildflowers! 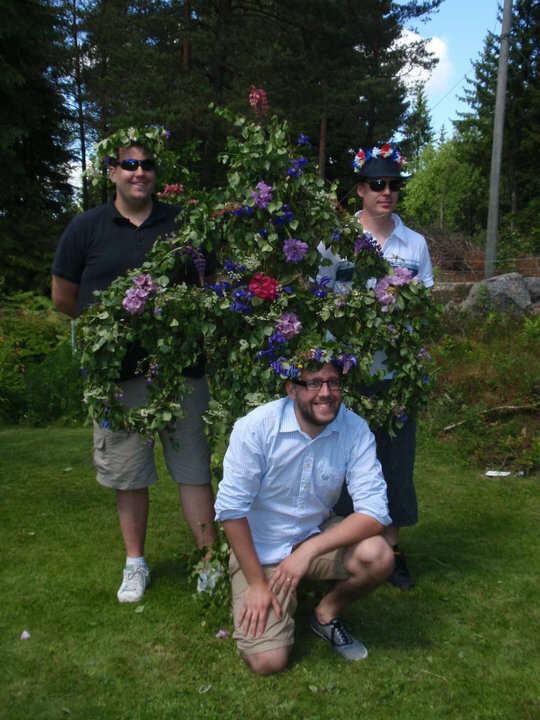 The boys posing with our May pole. Johan on the left is Caroline's boyfriend and Pontus on the right is Maria's (Fredrik's sister) fiance. Midsommar is now my favorite holiday. Well, Christmas and Midsommar are a close tie. 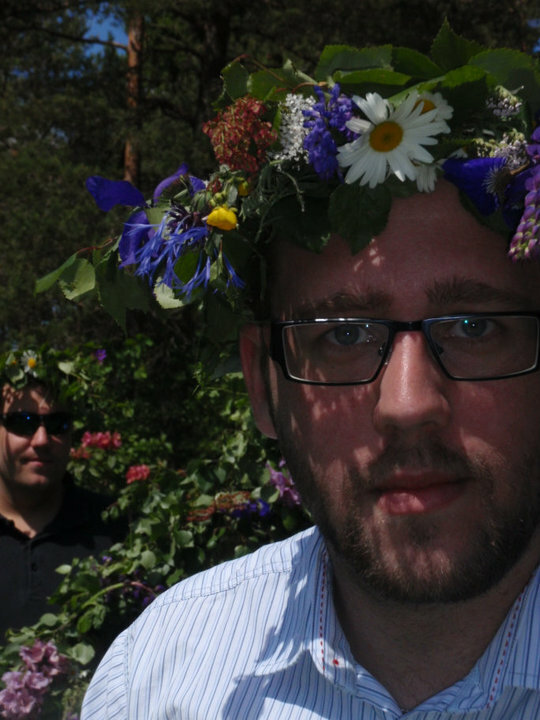 Midsommar is like Christmas, minus gifts (which as you get older isn't a big deal), and minus the cold weather. We had beautiful sunshine, great food, family, songs, flowers. It's the perfect holiday. We picked a lot of flowers. A LOT of flowers. Everybody who came brought a huge pail of flowers with them. 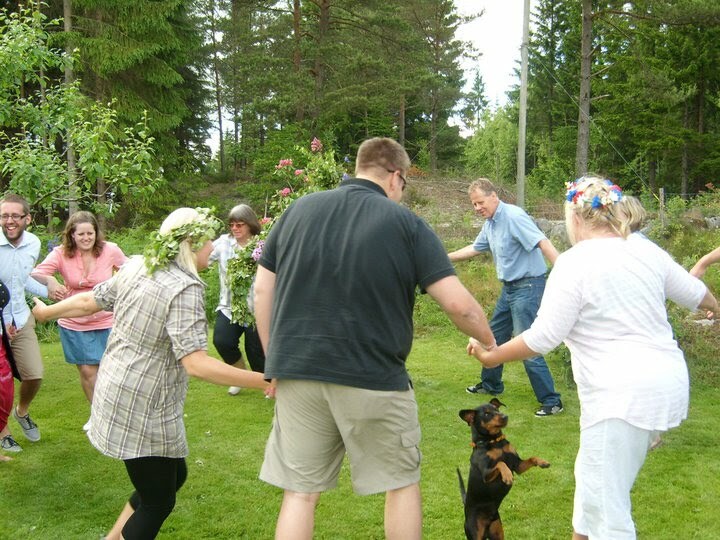 We made a "Midsommarstång", which is the maypole. 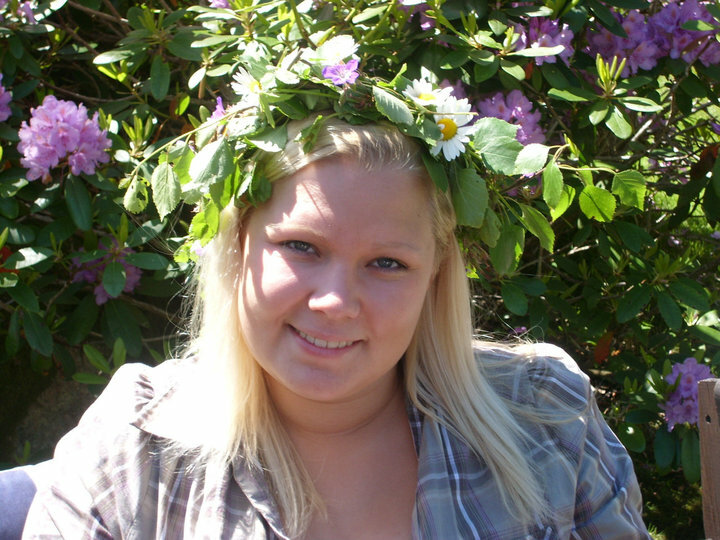 We covered it with birch wood and leaves, we made crowns made of birch and wildflowers, we set 13 places, for the 13 people. It was great. We ate sill, fresh potatoes with dill, meat balls, boiled eggs, caviar, I made enchiladas :), small sausages, shrimp, all sorts of bread. Doesn't sound appetizing, but it is! There was a game at dinner that made dinner so funny. Everybody had a secret "assignment" from Fredrik's mom. Mine was to say "back home in Kansas..." as often as possible. Fredrik was singing all the time, Maria was asking everybody to pass everything all the time, Hanna was insisting we sing songs every 2 minutes, Pontus was talking about how great Abba Sill is, the whole time, Nina was taking things from Johan's plate the whole time, Caroline asked everybody if they wanted more food all the time. It was hilarious! We drank "Akvavit" which is Swedish Snaps. We sang songs. We laughed. We talked. It was one of my favorites days here. After we ate, we actually danced and sang around the Maypole. That...was...hilarious. To watch grown men dance and hold hands and sing silly songs with silly hand motions. I laughed the whole time. After about 10 minutes of singing, laughing and dancing we had dessert. Yum. If you don't think Swedish food sounds good, Swedish desserts make up for it! We had "sockerkaka" made my Fredrik, a delicious red velvet cake with lime frosting and fresh strawberries, strawberries and cream, cookies, coffee, more Akvavit! We were stuffed! The rest of the day we spend talking and singing more songs, drinking a lot of beer, wine, cider and snaps. What a great day. The day after, luckily with no hangover, we spend the day outside. It was warm and very sunny. 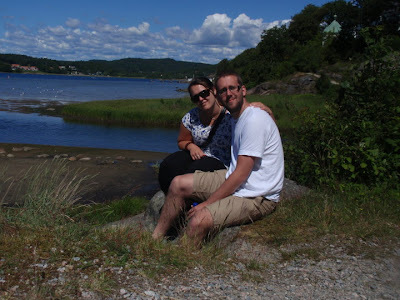 This is us taking a break with a small hike around Ljungskile, which is a smallish town about 15 miles from the cabin. It's beautiful with lots of boats and ocean. 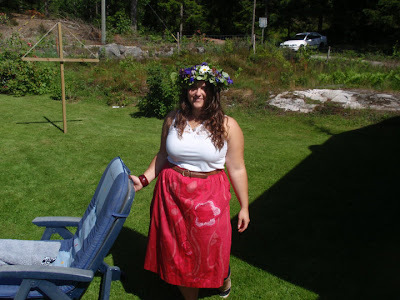 Now that Midsommar is over, we go back to regular summer. We spend our time taking walks, going to new places. Just enjoying our time together. Soon we go to Germany, and that is a WHOLE NEW kind of adventure for us. We will both be foreigners! How exciting and a little bit scary. Hope everybody has a great 4th of July! 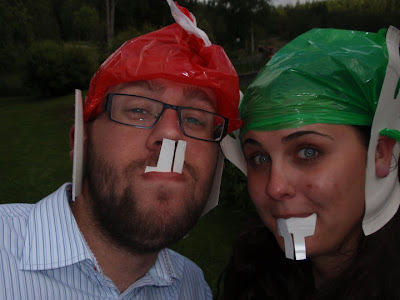 This is my 2nd 4th of July I've spent in Sweden. The first one wasn't so pleasant. A lot of people protesting against the U.S., but that was only about 2 and a half years after 9/11. So hopefully we can have our own quiet celebration, and I don't have to deal with *ahem* assholes. I'm going to make a fresh raspberry, blueberry and strawberry cake with cream cheese frosting! Yum! 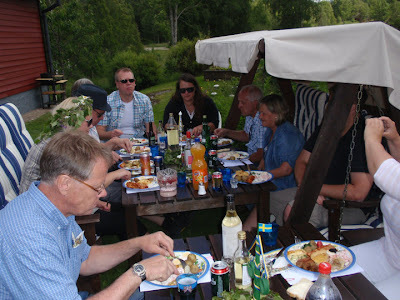 The Swedish thing of the day is Abba Sill. This is very, very, very popular in Sweden. I think 13 of us went through like...20 jars in one day. The first is mustard sill, then onion sill, original sill. 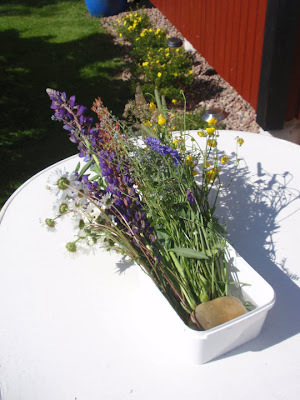 They eat this for Christmas, Easter, Midsommar, and other special occasions. The Swedish word of the day is "härligt" which means "awesome" or "nice" and is pronounced "haerligt". What a fun celebration! Sounds wonderful! I do think I would like more Swedish desserts than food. Missing your blog. Where have you been for the last month?? ?